CarArena is a game by IzE_Design , a Rally game where you play in special circuit in arena. You have five cars and five circuits. The style is a Cartoon style and the detail of game is very low, but the game is so funny. 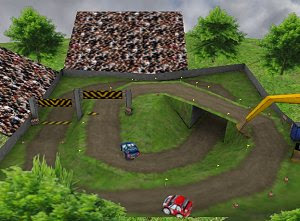 You challenge, head to head, a racer that is computer controlled or an other player in LAN. - Multiplayer: For the first time there's multiplayer, but this mode does not work very well (so far), you can play in LAN. You can play on Internet, but you MUST share your IP Address of Internet connection with the other player.